Magic universe reveals woman's elegance and endless glow. Such a woman deserves a unique gem. A gem of timeless beauty. A diamond. A perfume. Wish... Famous jewelers of the house of Chopard were inspired by diamond and presented the first Wish edition in 1999. It was poured in a beautiful diamond-shaped flacon and became a classic among woody-gourmand notes for women who like and appreciate Chopard's style. After the first Wish edition, four other versions were launched: Wish Pure, Wish Pink Diamond, Wish Turquoise Diamond and last year's Wish Magical Nights. The latest edition, Brilliant Wish, is even more precious, since its composition reinterprets value of brilliant and its shine, while fulfilling another wish to women who enjoy magic of the fragrance, sparkling composition and aura which highlights femininity and elegance. The new composition offers a blend of star jasmine and fruity notes surrounded with pink pepper. Velvety notes are softened with sensual accords of amber and wood. The fragrance was created by perfumers Louis Turner and Michel Girard. Its flacon is shaped like a diamond, just like previous editions, and it features accentuated golden details on neck and cap of the flacon, while its liquid is coloured in golden-yellow nuances. 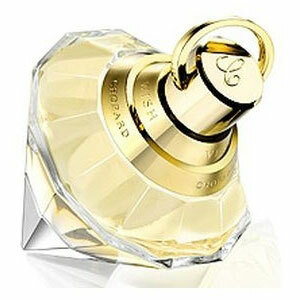 The perfume arrives on the market in March 2010 as 30 and 50ml EDP. Brilliant Wish was created by Louise Turner and Michel Girard.